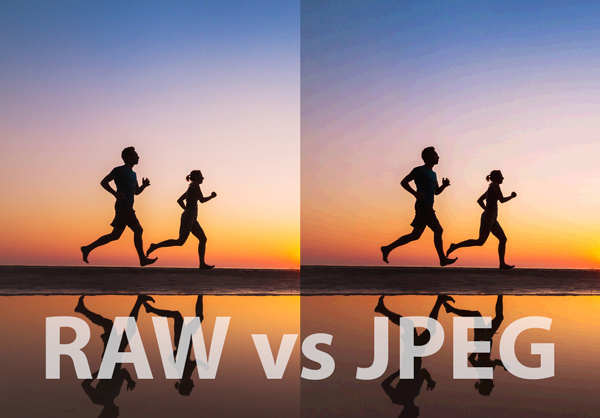 RAW vs JPEG: Which Should You Be Using To Get The Best Results? RAW vs JPEG: What’s The Difference? RAW is an image file format unique to each camera manufacturer. Essentially, it’s an exact copy of what your camera’s sensor captured when you pressed the shutter button. No post-processing is applied to the image before it is saved to your camera’s memory card. Now, that might seem rather obvious, and you might expect all image file formats to accurately store what your camera’s sensor captured. However, memory cards used to be much more expensive than they are now, and the maximum card capacity used to be quite small. Therefore, camera manufacturers had to use a more space-efficient image file format, so that more photos could be stored on the memory cards. That format was JPEG. The JPEG format is extremely portable. Every photo editing package can work with JPEG image files, and most digital platforms, including email, web browsers, messaging services and even digital TVs, can display JPEG images without a problem. Also, the JPEG format is very good at reducing file sizes but it does this by using compression techniques which throw away a lot of the detail and information in your photos. JPEG is an 8-bit technology, meaning that each combination of red, green and blue (RGB) pixel can be one of 16.8 million possible tones. Sounds great, doesn’t it? But the RAW image format uses 14-bit technology, giving an incredible 4.4 trillion different possible tones per RGB pixel combination. This translates into a much wider dynamic range – both in relation to pixel brightness and pixel color. A good visual example of the quality difference between a JPEG and RAW image of the same scene is a gradient in a sunset – where the dark sky at the top of the image gradually fades into the bright sunlight on the horizon. We can’t show you a real RAW image because it’s not a suitable format for displaying on the web. But the two side-by-side images below are representative of the difference between a JPEG and RAW image, with a slight exaggeration to emphasize the difference for illustration purposes. The image on the left (below) represents the JPEG image. The banding effect is due to the JPEG format not having enough different colors (between the blue at the top and the orange at the bottom) to create a continuous gradient. The image on the right (below) represents the RAW image, and the increase in quality is immediately apparent. The RAW image simply has a wider range of colors it can use, resulting in the seamless, continuous gradient you see below. The main downside to shooting RAW images is that the image file sizes are much larger. They can be anything between two and six times the size of the equivalent JPEG images. This means you’ll run out of space on your memory cards quicker, and it requires your camera to be capable of saving such large files quickly, so it’s ready to take the next shot. Luckily, memory cards are relatively cheap now and getting cheaper. So, unless you’re shooting thousands of images a day, and quality isn’t a big issue, you should always shoot RAW. By default, your camera will shoot in the JPEG format. This makes sense because most photographers starting out with photography won’t know or care about the difference between image file formats. To shoot RAW images, you first need to tell your camera that’s the format you want to shoot in. Below, you can see the Quality option is highlighted. The smooth arc represents “fine quality”, and the “L” means Large. Therefore, I know I’ll get the best quality JPEG the camera is capable of. But we haven’t told the camera to shoot in RAW mode yet. Selecting the Quality menu, I’m offered the option of shooting in either RAW mode, JPEG mode, or both. Below you can see I’ve now selected to shoot in RAW. I’ve also kept the fine quality, large JPEG option selected too. Your camera may allow you to choose one of several RAW modes, of different image sizes (like my Canon 5D mk ii does). However, I recommend that you always use the best, full-resolution RAW mode available to you. Exiting the Quality menu, my camera now confirms that I’ve selected both RAW and fine quality, large JPEG formats. Being able to shoot in RAW and JPEG at the same time is a great feature, as you get the best of both worlds. You get the best quality RAW image for when you need it, and the more convenient, portable JPEG image for less critical purposes. Once you’ve shot all your RAW images, you’ll want to transfer them from your camera’s memory card onto your computer and import them into your favorite editing program. In Photoshop CC, when you try and open a RAW image (and it’s a RAW format Photoshop CC recognizes), you’ll be prompted to makes some decisions about how the image, or images, will be imported. You can see the RAW image (the stacked cups and saucers) above. Above the image are a row of image editing features you can use, such as cropping, or rotating, etc. To the right of the image is a control panel which lets you make adjustments to the RAW image settings. These are settings which a JPEG image would have had “baked in”, had we only shot in the JPEG format. Crucially, you can’t undo the automatically applied settings for a JPEG image. RAW images let you make important decisions about settings long after you’ve taken the photo. These settings include exposure, white balance, and many other image properties. Below you can see the result of some changes I’ve made to the RAW image import settings. I’ve increased the exposure and the vibrancy. I also changed the white balance mode to “Tungsten” to compensate for the warm lighting. Many photo editing programs can import RAW images without any problems at all. However, if that doesn’t work for you, you may need to use an intermediary tool, such as Adobe Bridge. One enormous benefit of working with RAW images is that it’s non-destructive. You’ll always have your original RAW image file to go back to. In this article, you’ve had a brief introduction to RAW. You now know what it is, and understand the benefits of shooting RAW vs JPEG. To recap, the RAW image format retains the maximum amount of detail about the captured scene. It makes no automatic image adjustments. This results in greater dynamic range and smoother gradients from light to dark regions in your images. The RAW image format lets you make important changes to properties long after the photo is taken. For example, exposure, contrast, color saturation, sharpness, and white balance. So, what are you waiting for? When it comes to RAW vs JPEG – there’s no contest. Turn your camera’s RAW mode on, and start taking better quality photos today!